The Ethernet↔RS-485 interface converter ZET7076 allows to connect ZET 7xxx series sensors to Ethernet network. 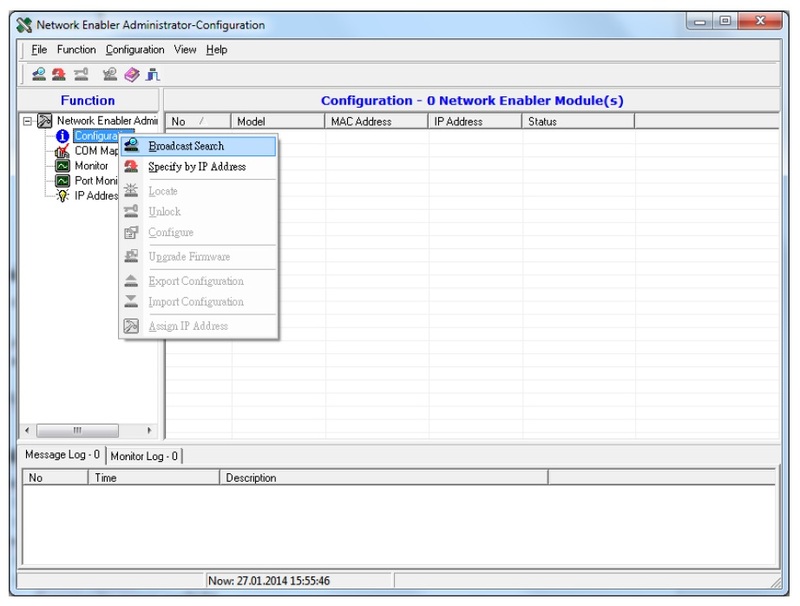 To work with the interface converter, the Network Enabler Administrator can be used. 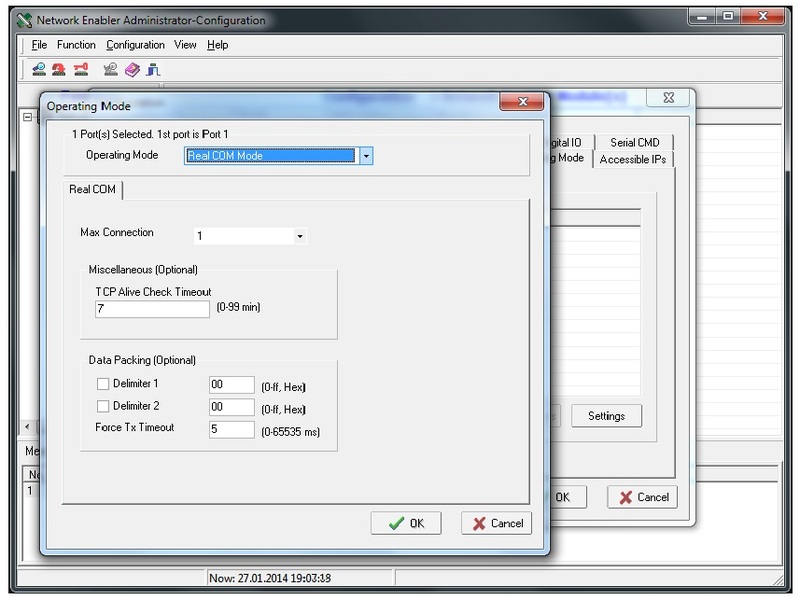 The Network Enabler Administrator is connected to ZET 7076 via the Ethernet network and creates a local COM port bound to the interface converter, through which data can be transmitted via the Modbus protocol. After installation and launch of the tool, scan for available devices in the Ethernet (see Figure 1). Switch the found device to the “Real COM Mode” (Configuration → Configure → Operating Mode → Real COM Mode), as shown in Figure 2. 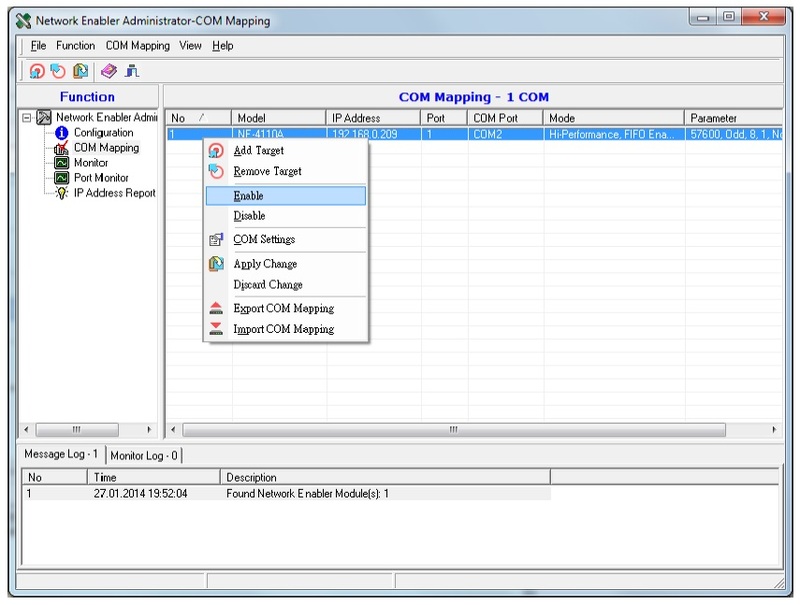 Then turn on the COM port emulation for the selected device using the COM Mapping menu (“Add Target”, “Apply Changes”, and “Enable” commands) as shown in Figure 3. After successful setup, a local COM port appears in the system, which can be used for operating with sensors. The data protocol will be the same as for connection via other interface converters, namely Modbus RTU (rather than Modbus TCP). When working with ZET 7076, note that this device transmits echo of the transmitted data, i.e. in response to a sent query, the sent query (echo) will be received first, and only then the sensor response. Form of the query and response sequence in the example with the ZET7010 sensor above is shown in Table 1. Thus, echo suppression should be implemented in a system using ZET 7076.